Alternative for the long-spineboard ? Using the long spine board for an extended period is not without any harm. Within 2 hours it can cause decubitus. 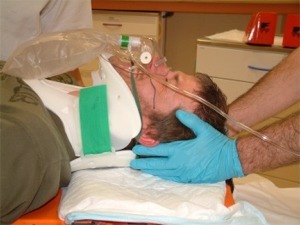 For this reason you should consider take your patient of the spine board a.s.a.p. In this period possible injuries of the (cervical) spine may not be diagnosed yet. So head end neck fixation must be continued on the soft Traumatras®. There is a relation between decubitus and use of the long spine board. More and more hospitals and traumacentre are underlining this. Prevention of decubitus starts in the earliest possible situation. Using the Traumatras, fixation of the (cervical) spine – and – prevention of decubitus are both achievable in a sensible way. Traumatras is the alternative for the long spine board in your emergency room.